Mobile Deposits - Picture perfect deposits made with your Apple or Android device! Depositing a check to your account at Solidarity is as easy as taking a picture with your phone or tablet! 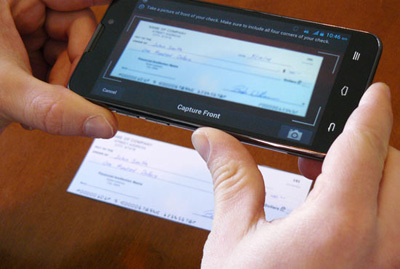 Just position the check to view through the camera of your smartphone, snap a picture of both the front and back of the check. It's saved as a picture file and you click to send it to your account at Solidarity. You will receive credit the same day if it is Monday-Friday before 2:30 pm, and the next business day if after 2:30 pm. Saturday, Sunday & Closed Holidays Mobile Deposits will be credited next business day. Mark the checks you deposit with Mobile Deposit and store briefly or shred after you see your credit on your account!